Since getting back into Skyrim I’ve been looking at the mods out there again and I found two light armor mods that I think are amazing looking! Both armor sets are available from Skyrim Nexus Mods and the best way to install each is through their mod manager. 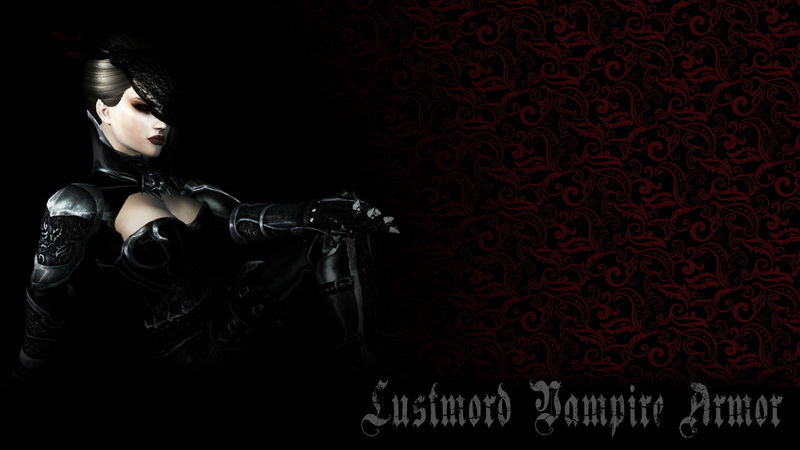 The creator of the two sets is AmethystDeceiver and I think they really have out done themselves with their Black Sacrament and Lustmord Vampire armor mods. First up let’s look at the Black Sacrament set. 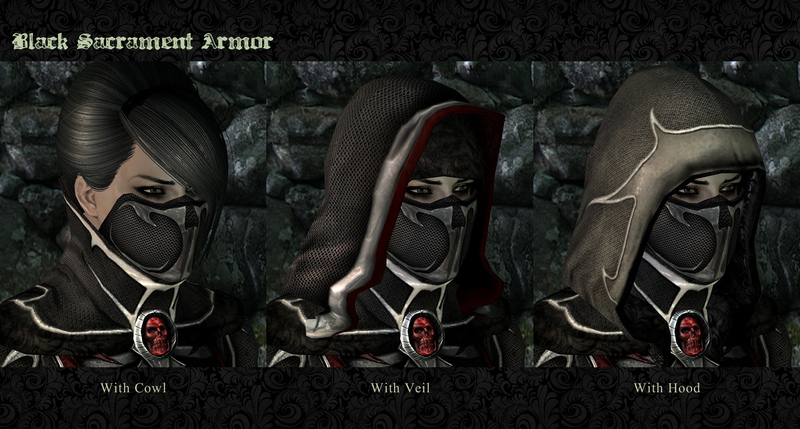 The Black Sacrament Armor pack is the first installment of The Black Phoenix Stealth Assassin guild mod. Black Sacrament Armor is a standalone, fully modular and customizable armor system comprised of multiple parts, add-ons and color variants, as well as a handful of new weapons. The second chapter for this set is still coming soon according to the developer. To craft this gear you should have received an initial quest marker (look in the Miscellaneous section of your quest journal). Locate the 5 assassin grave sites, exhume the shallow grave mounds, and loot the corpses to gain access to the spell tomes that will teach you the forging spells. There are a total of 10 forge spells, each armor set is craftable according to its color variant per spell. Many of the armors require human parts to craft. You can find an Assassins Bow in the quest loot which has a unique enchantment that will help you get all of the hearts and flesh needed. Make sure you are patched to at least Skyrim patch 1.6 in order for the quest markers to appear. If for some other reason the quest markers do not appear, double check your journal and highlight/unhighlight the quests to make the markers re-appear. Once you cast the crafting spell, you will see 4 categories: Steel, Leather, Jewelry, Misc. Steel – contains all of the armor’s “hard goods” – stuff like Cuirass, Gauntlets, Boots, Weapons etc. 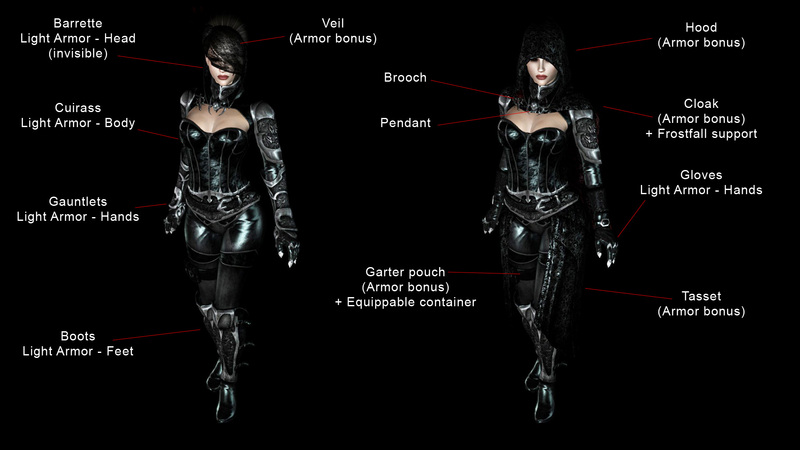 Misc – contains all of the armor’s female body variants. Supports: UNP (“Dimonized”), UNP skinny (“Petite”), UNPB (“Blessed”), CBBE Curvy (“Curvy”), CBBE slim (“Slim”). Use this in case you or your followers have a unique body type that differs from the default installed female body type. For the satchels: Small fits Petite and Slim, Medium fits Dimonized, Large fits Curvy and Blessed. This set works for both male and female body styles. Fully modular, multi-component Light Armor system in several color variants. This mod fully comes with: Independent spell-based crafting system (spells separated into color variants) and Bonus weapons pack with new weapon design. – New crossbow with standard and explosive fire bolts. – Simultaneously supports Vanilla/UNP/UNPB/CBBE body types (each craftable separately). – Independent spell-based crafting system. – Mini start-up quest: investigate a disturbance near Lost Tongue Overlook. – Garter pouch: Equippable storage pouch container (access using “voice” power). This mod requires Dawnguard and Skyrim patched to at least 1.7. The best way to install this mod is through your mod manager from Skyrim Nexus Mods. As with the other mod this developer made you will need to craft the gear. You should have received an initial quest marker (look in the Miscellaneous section of your quest journal). Locate the disturbance near Lost Tongue Overlook by following the objective marker. You will receive the Chaos Forge spell tome after completing this small quest. Once you cast the crafting spell learned from the tome, you will see 4 categories: Daedric, Leather, Jewelry, Misc. 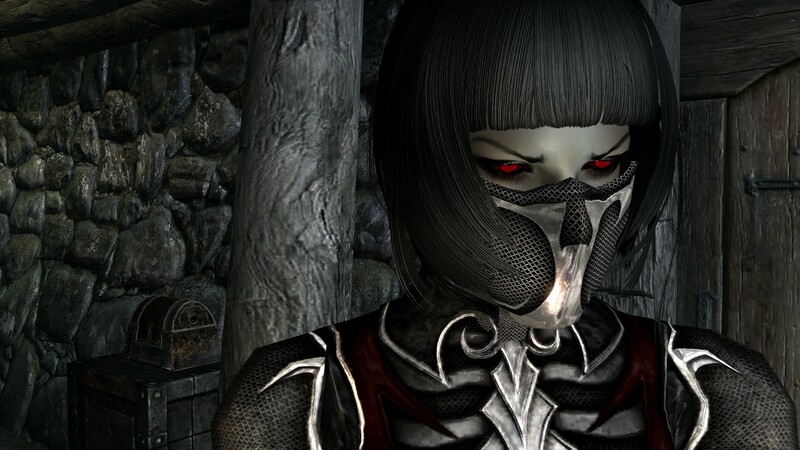 Daedric – contains all of the armor’s “hard goods” – stuff like Cuirass, Gauntlets, Boots, Weapons etc. 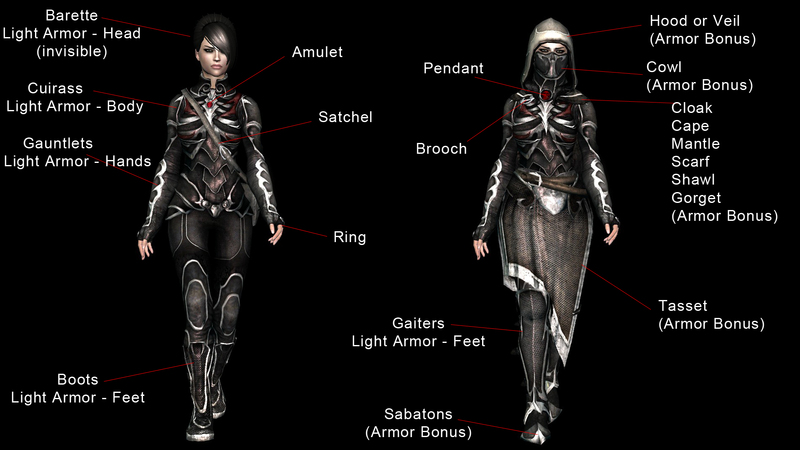 Misc – contains all of the armor’s female body variants. Supports: UNP/Vanilla (“Default”), UNPB (“Blessed”), CBBE Curvy (“Curvy”). Use this in case you or your followers have a unique body type that differs from the default installed female body type. For the Garters: Curvy fits CBBE Curvy, the default one will work for both the standard and Blessed body types. Both of these sets look amazing and really add to the gameplay in my opinion! Try them out and let me know what you think! Do you have a suggestion for a mod I should try? Let me know! I ordered Skyrim for pc mainly because of a great outfit like this one. I wish I could have this outfit for my ps3 version. Skyrim is one of my most played games on my ps3. I started Skyrim on my PS3 as well. However, when I saw all the mods I had to go with the PC version. Once I started that one I never went back to my PS3 one. I’m glad you are enjoying the modding for Skyrim! 🙂 Thanks for commenting and coming by!